easygenerator | Which is Correct, I or Me? Which is Correct, I or Me? In one way or another, you've probably had your grammar corrected. The English language can be confusing, especially when using the personal pronouns "I" or "me." Even so, would you make an effort to correct the mistake or just brush it off? Although it's common to misuse personal pronouns, the rules are very easy to understand and perform. A proper noun indicates the name of a person — Janet, Nick, Robert, and Tina. A personal pronoun replaces the noun that refers to a person or people — I, me, us, and we. 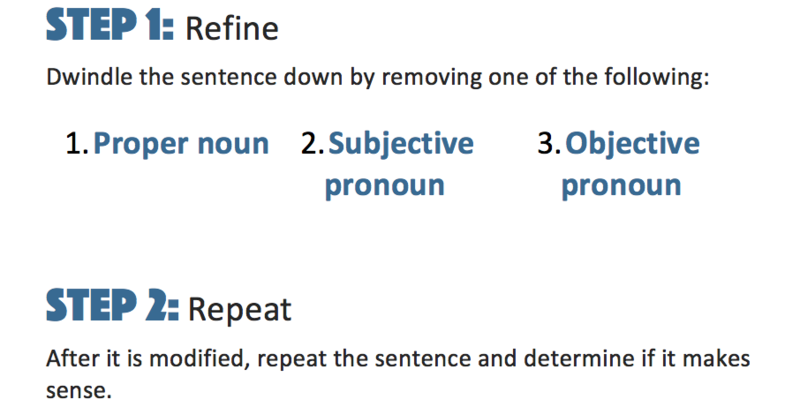 A subjective pronoun is the subject of a sentence that performs the action of the verb. Subjective pronouns are specific personal pronouns — I, he, she, you, and we. He and I walked to class. Eventually, Nicole and I went home. An objective pronoun is the object of a sentence receiving the action of the verb. Objective pronouns are specific personal pronouns — me, him, her, you, and us. Megan watched Brandon and me drive away. Then, the cop pulled you and me over. Personal pronoun Personal "I" or "me"
Emma is a proper noun. "I" and "me" are subjective pronouns. "me" is a personal pronoun and an objective pronoun. He already told Laura and (I or me) to get ready. He told Laura and me to get ready. If Katie and (I or me) don't study, we’ll fail the test. If Katie and I don't study, we'll fail the test. Between you and (I or me), this is a terrible idea. Between you and me, this is a terrible idea. Lastly, never link subject and object pronouns together in a phrase. Taylor and (I or me) need to go shopping. Taylor and Ime need to go shopping. The teacher asked Maria and (I or me) to stop talking. The teacher asked Maria and meI to stop talking. You and ​ have class on Monday. He will speak to Kristen and ​ later.